What says great outdoor summer cooking like gigantic BBQ shrimp on a stick over fire! This recipe is easy to prepare and quick to cook if you prep in advance. Not to mention light, healthy and scrumptious. Marinade- 1/2 cup of pineapple juice, two tablespoons of soy sauce, juice of one lime, 2 cloves garlic (crushed), 3/4 teaspoon Old Bay Seasoning or Adobo, black pepper to taste, pinch of saffron. Combine the marinade ingredient. Add cleaned, shelled and deveined shrimp into a large Tupperware container and pour marinade over, working it all over the shrimp. Refrigerate for 2 hrs. Heat grill to med-high. Take slightly waterlogged skewers and assemble. I skewer most shrimp the long way to get even cooking and any leftover shrimp in a cresent shape for variety purposes only. The shrimp will cook rather quickly, so any pre-grilling of veggies or pineapple will help in texture and for presentation. Hit with your glaze or favorite BBQ sauce. Shrimp skewers hit the grill! Place skewers evenly on medium-hot grill and cover for three minutes. Turn skewers and cook for three more minutes. Serve and Enjoy! 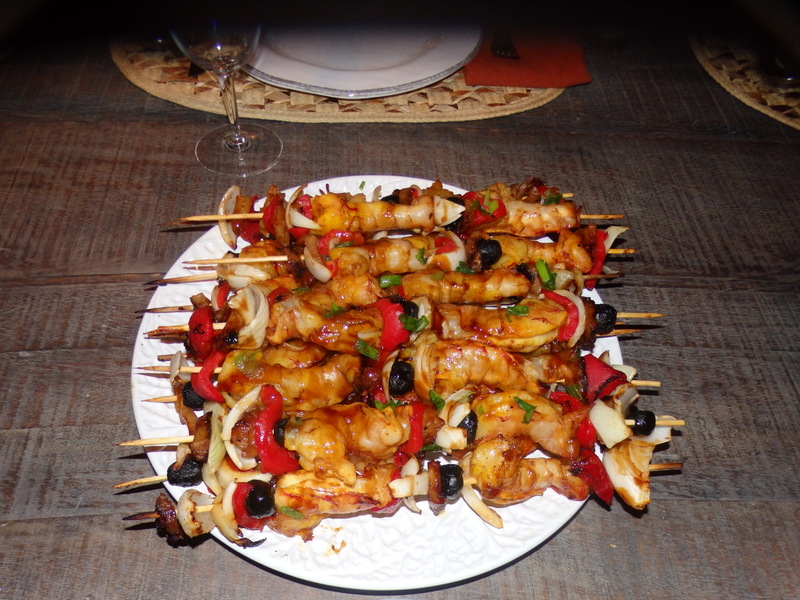 Shrimp skewers and grilled chicken. Rice and lentils with grilled veggies. Next Three Clam Recipes Just for the Shuck of It! Clams with black bean sauce. A rainbow of autumn carrots from the farmer’s market at Union Square. Topped with scallions, cheddar and sauce.